Background: Among Mycobacterium abscessus complex infections, patients with M. abscessus subsp. abscessus (MAA) lung disease are difficult to treat and no standard therapy has been established. Few reports have investigated the drug susceptibility of these strains. We retrospectively investigated how in vitro drug susceptibility testing (DST) of MAA affects the induction of sputum conversion using pharmacotherapy. Methods: Patients with MAA lung disease diagnosed and treated between 2010 and 2014 at our hospital were enrolled and divided into Group A (sputum conversion without relapse within 1 year) and Group B (persistent positive cultured or negative conversion with relapse). MAA was identified in M. abscessus using sequence with genotyping, and DST of MAA was performed. Results: We assessed 23 patients (9 males and 14 females). There were 8 patients in Group A and 15 in Group B. Higher prevalence of susceptible isolates for clarithromycin (CAM) susceptibility on day 14 was noted in Group A than in Group B (P = 0.03) and no significant difference observed in the two groups for other drugs. Conclusions: In vitro DST of MAA, especially CAM susceptibility on day 14, affected the results of negative conversion. No other drugs were found to affect sputum culture negative conversion. The Mycobacterium abscessus complex (MabC) comprises a group of rapidly growing mycobacteria (RGM) that represent the most common etiological agents of lung disease.,, MabC bacteria are resistant to many antibiotics in vitro,, leading to unfavorable treatment results. Recently, it was reported that, the MabC is differentiated into three subspecies: M. abscessus subsp. abscessus (MAA), M. abscessus subsp. massiliense (MAM), and M. abscessus subsp. bolletii. In particular, MAA lung disease has poorer treatment outcomes than MAM because of macrolide resistance induced by M. abscessus erythromycin resistance methylase gene erm (41). When a T or C polymorphism occurs at position 28 of the gene, the mutation generates a loss of function of the erm (41) gene (C28 sequevar); isolates of the C28 sequevar are usually susceptible to macrolides. In addition to inducible macrolide resistance, acquired macrolide resistance can develop during antibiotic treatment due to mutations in the 23S rRNA gene (rrl). This study aimed to evaluate the in vitro drug susceptibility of several antibiotics and to assess the influence of in vitro drug susceptibility of pathogens on MAA lung disease outcomes. 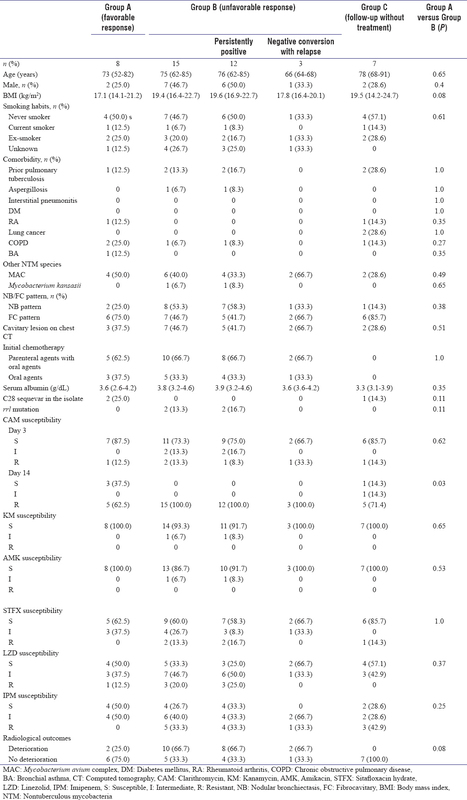 In this retrospective, single-institution study, files from all consecutive patients referred to National Hospital Organization Kinki Chuo Chest Medical Center, a 385-bed center in Southern Osaka that specializes in pulmonary disease, from January 1, 2010, to December 31, 2014 were reviewed. Patients with MabC lung disease were included if they met the American Thoracic Society (ATS) diagnostic criteria: presence of at least two positive sputum cultures or one bronchoalveolar lavage culture or one lung tissue biopsy specimen culture positive for MabC, along with pulmonary symptoms and chest computed tomography (CT) findings. In addition, patients were included if their isolates were available (in storage) and if they were followed up at least for 1 year until January 2015. This study was approved by the Ethics Committee of Kinki Chuo Chest Medical Center (No. 502, date of approval: July 25, 2015). Informed consent was waived because of the retrospective nature of the study. Information on patient history was obtained at admission or during an outpatient visit. Height and weight were measured. Data on comorbidities and the course of antinontuberculous mycobacteria (NTM) treatment were collected from the medical records. Patients were diagnosed with MAA of sputum isolates which were identified by hsp65, rpoB, and erm (41). Patients received combination antibiotic therapy as recommended by the ATS and Infectious Diseases Society of America. In addition, patients were diagnosed with NTM coinfection if NTM species other than the MabC was isolated at least twice. Disease progression was determined in the time interval between the time of making the diagnosis and the 1-year follow-up. After 12 months of treatment, sputum culture conversion or relapse was periodically assessed. Sputum culture negative conversion was defined as two consecutive negative cultures within 3 months after therapy for 12 months. If a patient could not expectorate sputum even after sputum induction, sputum conversion from positive to negative was considered to have occurred. Relapse was defined when there was at least one positive sputum culture during the study period and the positive sputum culture became negative. The enrolled patients were classified into three groups: Group A (favorable response), which comprised patients with MAA lung disease in the negative conversion group; Group B (unfavorable response), which comprised patients with persistently positive cultures or negative conversion with relapse; and Group C (no treatment intervention), which comprised patients with follow-up for at least 1 year without any antibiotics. We performed DST in vitro before the treatment. The interpretative breakpoints used were those recommended by the Clinical and Laboratory Standards Institute (CLSI). The minimal inhibitory concentration (MIC) was defined as the lowest concentration of drug that inhibited visible growth. MICs in CAM were determined in cation-adjusted Mueller–Hinton medium using the broth microdilution method (pH 7.35–7.40). Plates were evaluated after 3 days and then incubated for 14 days to obtain a final reading to ensure the detection of inducible resistance. The MIC of CAM was determined on day 3 and day 14 after incubation; MAA isolates were considered susceptible (MIC ≤2 μg/mL on day 3 and day 14) or resistant (MIC ≥8 μg/mL on day 3). Susceptibilities to other antibiotics (kanamycin [KM], amikacin [AMK], linezolid [LZD], and imipenem [IPM]) were also evaluated according to previous reports., The breakpoint of sitafloxacin hydrate (STFX) was complained with it of moxifloxacin and ciprofloxacin for RGM in CLSI. Categorical variables were analyzed using the Chi-square or Fisher's exact test. Continuous variables were analyzed using the Mann–Whitney U-test or t-test. All P values are two-sided. P < 0.05 indicates statistical significance. Statistical analyses were performed using the JMP statistical software (12th version, SAS Institute Inc., Cary, NC, USA). Proportions and medians were used to describe demographic, clinical, and radiographic characteristics. Among 79 patients with at least one respiratory sputum culture containing an MabC isolate, 38 had the MAA isolate, and in 3 patients, the isolate could not be confirmed because their isolate cultures did not develop. None were identified as having M. abscessus subsp. bolletii or MAA/MAM mixed lung disease. Of the 38 patients with at least one respiratory sputum culture of the MAA isolate, there were 30 with MAA lung disease who met ATS diagnostic criteria [Figure 1]. 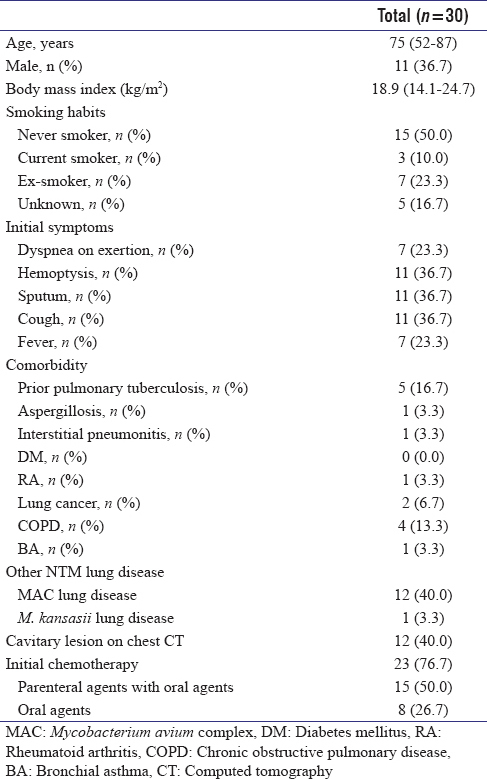 The characteristics of the 30 patients with MAA lung disease are summarized in [Table 1]. Their median age was 75 (range, 52–87) years; there were 11 (36.7%) males and 19 (63.3%) females. Cavitary findings were observed in the chest CT findings in 12 patients (40.0%). There were 5 patients (16.7%) with prior pulmonary tuberculosis and 13 (43.3%) with infections by other NTM species. Treatment for MAA lung disease was administered for at least 1 year in 23 patients (76.7%) [Table 2] and [Table 3]. Negative conversion occurred in 8 patients (34.8%) (8 patients in Group A [negative conversion group]; 15 in Group B [persistently positive cultures: 12, negative conversion with relapse: 3]; 7 in Group C [follow-up without any antibiotics for at least 1 year]). Susceptibilities to each drug (CAM day 3, CAM day 14, KM, AMK, STFX, LZD, and IPM) were 87.5, 37.5, 100.0, 100.0, 62.5, 50.0, and 50.0, respectively, in Group A and 73.3, 0.0, 93.3, 86.7, 60.0, 33.3, and 26.7, respectively, in Group B. MAA isolates from the 8 patients in Group A more frequently exhibited susceptibility to CAM on day 14 than patients in Group B (Group A: 3 patients [37.5%] vs. Group B: 0 patients [0.0%], P = 0.03) [Table 3]. Two isolates of the C28 sequevar for erm (41) and one isolate of the T28 sequevar in Group A exhibited CAM susceptibility on day 14. In contrast, two isolates of the rrl gene were observed only in Group B. There was not significantly relationship between susceptibility to other antibiotics (KM, AMK, STFX, LZD, and IPM) and biological outcomes [Table 3]. One of the seven patients had the isolate of the C28 sequevar, and no patient in Group C had the isolate with rrl mutation [Table 3]. This study demonstrated two important findings. First,in vitro DST of MAA isolates greatly affects negative conversion in patients with MAA lung disease. Our findings indicated that CAM susceptibility on day 14 is of particular importance. No clear relationships were shown indicating whether the other drugs affected negative conversion. Second, patients with MAA lung disease having the C28 sequevar in their isolate tended to exhibit negative conversion. MAA is known to have poorer treatment outcome because of drug resistance to many antibiotics even among other types of nontuberculous mycobacteria. Susceptibility to CAM, AMK, and IPM is usually maintained. It has been proposed that rather than in vitro DST with a standard culture period of 3 days, CAM should be cultured for 14 days because of inducible resistance due to the erm (41) gene. The guidelines recommend selecting the treatment regimen based on in vitro DST of MAA. Our investigation of the correlative relationships between susceptibility to several antibiotics with bacterial negative conversion in patients with MAA lung disease demonstrated that CAM susceptibility on day 14 strongly influenced negative conversion. This result was consistent with the results of a single-institution study conducted in South Korea. We performed susceptibility tests for other drugs and investigated the correlation between negative conversion in the present study. We were unable to prove any clear correlative relationships showing susceptibility to drugs other than CAM. These findings suggest that CAM is a key drug for treating MAA lung disease. Further studies are needed to identify an appropriate regimen that achieves a good balance between treatment success and toxicities in patients with MAA lung disease. Although we observed a tendency for negative conversion of the C28 sequevar in the isolate of MAA lung disease, this finding was not statistically significant. Park et al. indicated that the C28 sequevar in the MAA isolate affects bacterial negative conversion in MAA lung disease. The lack of a significant difference noted in the present study might have been due to the small sample size. Interestingly, the C28 sequevar accounted for many patients undergoing follow-up observations due to a lack of progression and for patients who did not meet the diagnostic criteria. This suggested that MAA lung disease with the isolate of the C28 sequevar does not cause rapid progression and that treatment intervention might be unnecessary. Current recommendations for MAA lung disease treatment are based on case series studies with no comparison cases or on individual experience.,, Harada et al. reported the DST of the MabC isolate in the registry study, but they did not evaluate how in vitro DST of MAA affects the induction of sputum conversion, and few reports have evaluated the clinical effects of various drugs. The present study investigated the usefulness of DST of the MAA isolate and found that susceptibility to CAM on day 14 greatly affected sputum conversion. DST results for CAM susceptibility on day 3 indicated more resistance than those reported by Park et al. and Koh in Korea. There are several explanations for this difference in CAM susceptibility on day 3 and the rate of negative conversion in MAA lung disease. There is a likelihood of the influence of regional differences in the same Asian area and the mechanism of resistant to CAM (not only inducible resistance but also natural resistance). The importance of CAM susceptibility is similar in patients with M. avium complex lung disease, indicating that CAM susceptibility is related to the treatment response rate. No effective treatment regimen has been established for CAM-resistant MAC lung disease, and the prognosis is poor. Moreover, an inappropriate regimen can induce CAM resistance. Many patients with MAA lung disease have a history of receiving chemotherapy including CAM for MAC lung disease. Having already underwent treatment for MAC lung disease, which is a common comorbidity, may affect the results of DST of MAA lung disease and ultimately affect negative conversion in patients MAA lung disease. The limitations of this study were the fact that it was a single-institution study with a small sample size; further, it was a retrospective cohort study. The treatment regimens were decided by physicians. 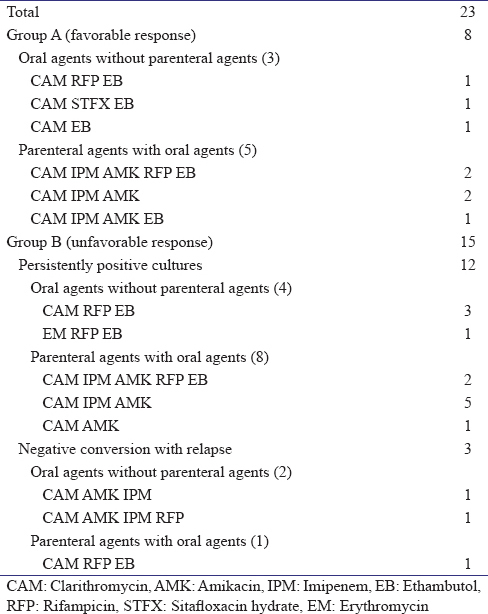 Oral agents (CAM, EB, RFP, and STFX) as the initial treatment were received because some patients refused the admission. In terms of sputum conversion, we could not divide our analysis according to cases of reinfection and continued infection. Although parenteral agents such as AMK and IPM are considered necessary when treating patients with pulmonary MAA disease, current recommended regimens are limited by factors such as toxicity. In the present study, LZD and KM were rarely used to treat MAA lung disease because of the moderate-to-severe side effects in Japan. In the future, multicenter prospective studies with a unified regimen need to be conducted to investigate this research topic further. In vitro DST of MAA isolates greatly affects sputum conversion. This study revealed that CAM susceptibility on day 14 in MAA isolates is of particular importance. There was no association between susceptibility to other drugs (KM, IPM, AMK, and STFX) and biological outcomes. Choi WS, Kim MJ, Park DW, Son SW, Yoon YK, Song T, et al. Clarithromycin and amikacin vs. Clarithromycin and moxifloxacin for the treatment of post-acupuncture cutaneous infections due to Mycobacterium abscessus: A prospective observational study. Clin Microbiol Infect 2011;17:1084-90. Halstrom S, Price P, Thomson R. Review: Environmental mycobacteria as a cause of human infection. Int J Mycobacteriol 2015;4:81-91. Malin R, et al. Mycobacterium abscessus: An environmental mycobacteria being a human pathogen. Int J Mycobacteriol 2015;4:41. Wong YL, Ong CS, Ngeow YF. Molecular typing of Mycobacterium abscessus based on tandem-repeat polymorphism. J Clin Microbiol 2012;50:3084-8. Chopra S, Matsuyama K, Hutson C, Madrid P. Identification of antimicrobial activity among FDA-approved drugs for combating Mycobacterium abscessus and Mycobacterium chelonae. J Antimicrob Chemother 2011;66:1533-6. Mukherjee T, Boshoff H, Barry CE 3rd. Comment on: Identification of antimicrobial activity among FDA-approved drugs for combating Mycobacterium abscessus and Mycobacterium chelonae. J Antimicrob Chemother 2012;67:252-3. Jeon K, Kwon OJ, Lee NY, Kim BJ, Kook YH, Lee SH, et al. Antibiotic treatment of Mycobacterium abscessus lung disease: A retrospective analysis of 65 patients. Am J Respir Crit Care Med 2009;180:896-902. Adékambi T, Berger P, Raoult D, Drancourt M. RpoB gene sequence-based characterization of emerging non-tuberculous mycobacteria with descriptions of Mycobacterium bolletii sp. Nov. Mycobacterium phocaicum sp. Nov. And Mycobacterium aubagnense sp. Nov. Int J Syst Evol Microbiol 2006;56:133-43. Bastian S, Veziris N, Roux AL, Brossier F, Gaillard JL, Jarlier V, et al. Assessment of clarithromycin susceptibility in strains belonging to the mycobacterium abscessus group by erm(41) and rrl sequencing. Antimicrob Agents Chemother 2011;55:775-81. Jarand J, Levin A, Zhang L, Huitt G, Mitchell JD, Daley CL, et al. Clinical and microbiologic outcomes in patients receiving treatment for Mycobacterium abscessus pulmonary disease. Clin Infect Dis 2011;52:565-71. Koh WJ, Jeon K, Lee NY, Kim BJ, Kook YH, Lee SH, et al. Clinical significance of differentiation of Mycobacterium massiliense from Mycobacterium abscessus. Am J Respir Crit Care Med 2011;183:405-10. Koh WJ, Jeong BH, Kim SY, Jeon K, Park KU, Jhun BW, et al. 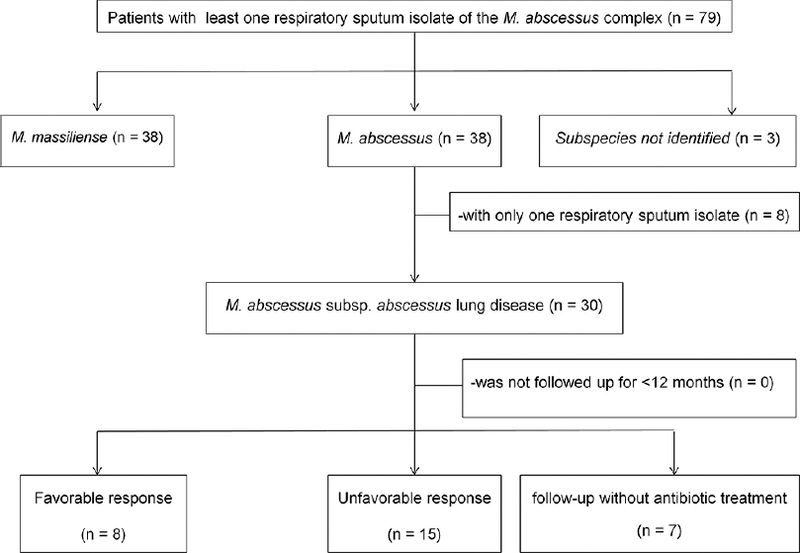 Mycobacterial characteristics and treatment outcomes in Mycobacterium abscessus lung disease. Clin Infect Dis 2017;64:309-16. Harada T, Akiyama Y, Kurashima A, Nagai H, Tsuyuguchi K, Fujii T, et al. Clinical and microbiological differences between Mycobacterium abscessus and Mycobacterium massiliense lung diseases. J Clin Microbiol 2012;50:3556-61. Park J, Cho J, Lee CH, Han SK, Yim JJ. Progression and treatment outcomes of lung disease caused by Mycobacterium abscessus and Mycobacterium massiliense. Clin Infect Dis 2017;64:301-8. Griffith DE, Aksamit T, Brown-Elliott BA, Catanzaro A, Daley C, Gordin F, et al. An official ATS/IDSA statement: Diagnosis, treatment, and prevention of nontuberculous Mycobacterial diseases. Am J Respir Crit Care Med 2007;175:367-416. Yoshida S, Tsuyuguchi K, Suzuki K, Tomita M, Okada M, Shimada R, et al. Rapid identification of strains belonging to the Mycobacterium abscessus group through erm(41) gene pyrosequencing. Diagn Microbiol Infect Dis 2014;79:331-6. Kothavade RJ, Dhurat RS, Mishra SN, Kothavade UR. Clinical and laboratory aspects of the diagnosis and management of cutaneous and subcutaneous infections caused by rapidly growing mycobacteria. Eur J Clin Microbiol Infect Dis 2013;32:161-88. Falkinham JO 3rd. Epidemiology of infection by nontuberculous mycobacteria. Clin Microbiol Rev 1996;9:177-215. Barberán J, García-Pérez FJ, Villena V, Fernández-Villar A, Malmierca E, Salas C, et al. Development of Aspergillosis in a cohort of non-neutropenic, non-transplant patients colonised by Aspergillus spp. BMC Infect Dis 2017;17:34. Yoshida S, Arikawa K, Tsuyuguchi K, Kurashima A, Harada T, Nagai H, et al. Investigation of the population structure of Mycobacterium abscessus complex strains using 17-locus variable number tandem repeat typing and the further distinction of Mycobacterium massiliense hsp65 genotypes. J Med Microbiol 2015;64:254-61. Brown-Elliott BA, Wallace RJ Jr. Clinical and taxonomic status of pathogenic nonpigmented or late-pigmenting rapidly growing mycobacteria. Clin Microbiol Rev 2002;15:716-46. Tanaka E, Kimoto T, Tsuyuguchi K, Suzuki K, Amitani R. Successful treatment with faropenem and clarithromycin of pulmonary Mycobacterium abscessus infection. J Infect Chemother 2002;8:252-5. Namkoong H, Morimoto K, Nishimura T, Tanaka H, Sugiura H, Yamada Y, et al. Clinical efficacy and safety of multidrug therapy including thrice weekly intravenous amikacin administration for Mycobacterium abscessus pulmonary disease in outpatient settings: A case series. BMC Infect Dis 2016;16:396. Tanaka E, Kimoto T, Tsuyuguchi K, Watanabe I, Matsumoto H, Niimi A, et al. Effect of clarithromycin regimen for Mycobacterium avium complex pulmonary disease. Am J Respir Crit Care Med 1999;160:866-72. Morimoto K, Namkoong H, Hasegawa N, Nakagawa T, Morino E, Shiraishi Y, et al. Macrolide-resistant Mycobacterium avium complex lung disease: Analysis of 102 consecutive cases. Ann Am Thorac Soc 2016;13:1904-11. Griffith DE, Philley JV, Brown-Elliott BA, Benwill JL, Shepherd S, York D, et al. The significance of Mycobacterium abscessus subspecies abscessus isolation during Mycobacterium avium complex lung disease therapy. Chest 2015;147:1369-75.